being this isn't cannon and doesn't really fit at all into either DC or IDW timeline, James Tynion is probably given free reign to do as he pleases. my guess is that the 2012 Nick cartoon has left the impression that Donnie isn't as good a warrior as Leo or Raph. i'm just wondering if James Tynion saw any of the 4kids cartoons? or if he's getting his impression of the characters from the Nick cartoon or (GASP!) the Bay-Turtles???? ......let's hope not on that last part! I think casual fans just make the assumption that since he is smart, he's weak. Old stereotype. Lord knows he probably saved the day more than any other in the original cartoon. Not sure if he's ever really been portrayed as the weak link, truly. Yeah, that's dumb. There's no reason to think he wouldn't have had exactly the same training regime as all of his brothers. they definitely didn't read 'New York Ninja'. well Im mean if you think about it. With how smart he is, you think he would have the most polished technique with how hypercritical he is with other aspects of his life such as his studies. Awesome to see a follow-up to the original mini, as I quite enjoyed it (Thought the BTAS/Nick one was just okay) and never expected them to ever make a direct sequel. (Much like TMNT/GB, but we live in a lovely world. XD) Also really cool that we'll see some action in the Turtles' universe this time around, so it'll be fun to see any new crossover elements that get introduced as the story goes on. Looking forward to seeing more! 1. Getting a major PD vibe from the page with the Turtles on hoverboards and Donnie in almost full PD gear with holographic gizmos. I really hope that this Batman/TMNT story is written with care to Bane. He isn't evil and he doesn't have any evil agenda. In later years he's even teamed up with Batman and gone on adventures together. Right now he's busy traveling across the whole world, breaking up mobster groups everywhere to bring them into order and it's even above board with Batman. If Bane just pops into the IDW TMNT dimension like, "RAHHH, I want to invade this new city and take it over because I'm a bad guy and I like to BREAK people!" well... that's completely the antithesis who Bane is and what he's about. Last edited by Andrew NDB; 09-14-2017 at 05:18 PM. I've just got my hands on the six issues of the 2nd Bats / TMNT X-Over. I haven't read it yet, but looking forward to it. Nice to see a third story is already being lined up. Knightfall is a really good read. I have two volumes of it and it's pretty long. 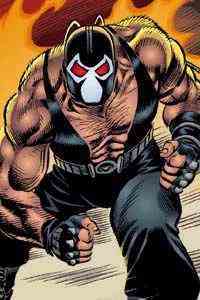 Bane is one of the few villains I felt TAS did not do justice. Pretty barebones interpretation of the character. The Nick crossover was mainly about Scarecrow and Mad Hatter, I wonder what this one will be about. Shredder's team up with Ra's Al Gul and the League of Assassins was glossed over too quickly the first time around, I wonder if this will continue that plotline? Then again if the new crossover takes place in the "current" IDW timeline...Shredder is dead so they may not use that. In fact I'm very interested to see where they place this crossover, if it picks up directly where the last one ended or a "years later" type deal. That might make sense. There's been at least one time I know that Bane has tried to create an "improved" venom. I guess with some form of the mutagen, he could try and find a way to mutate himself to his full-on venom state, permanently, so that he doesn't need the drug anymore. Sounds like based on the first idea, it would be good to team up people who were like each other, but who cares what I think I just buy all of this stuff. I guess that's fair on the former. Bane isn't a bully, though. He's a super intelligent strongman who was designed to be the Anti-Batman... physical equal as well as mentally. He doesn't bully anyone, he just kills them.